Yes, you can teach on-board dogs new tricks, like how to swim safely and wear PFD’s. Ed Johnson of Washington knows from experience that waxed fiberglass decks and running dogs don’t mix. His 125-pound Great Dane, Isabella, made quite a splash when she plunged unexpectedly into the Potomac. Isabella now sports a bright yellow life jacket whenever she is topside on his 35-foot sailboat. Aboard kayaks and cruisers, on lakes and oceans, a growing number of boaters like to take their pets along for the ride. It seems simple enough — just plop Fido or Fluffy on board and push off. But do so without adequate preparation and you may find that your pet either cowers in a corner shaking with fear, or brazenly dives into the water, pouncing on unsuspecting ducks or dolphins. Order an ID tag for your pet that includes your boat’s permanent marina location and slip number as well as a phone contact for when you’re afloat. (Cell phones will work close in, but their range is short and coverage is spotty.) Or consider having an ID microchip implanted in your pet. The chip, about the size of a grain of rice, is inserted at the scruff of the neck and contains a number linked to a national registry. Teach your dog basic safety commands, such as “on boat,” “off boat,” “stay” and “sit.” Good luck finding any verbal command a cat will pay attention to. Obtain seasickness medication for your pet if necessary. “The first time out is not the telltale,” warned Jody Findlay, a supervisor at Alexandria’s West Marine store, who lives aboard a 40-foot houseboat with her Rottweiler, Kohl. Often, in time, pets will become conditioned to the motion, but sometimes medication is needed. While the same medications used for humans — Benadryl, Bonine, Dramamine — also work for pets, consult your vet. Whatever you do, don’t let animals take refuge in the V-berth — that’s where motion is felt most. 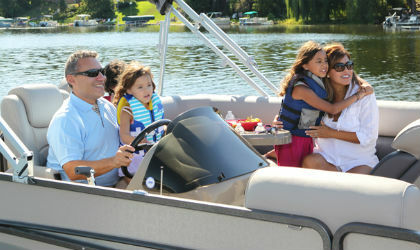 A nest of secured cushions or a carrier near the boat’s center of motion will help skittish pets feel safe. Introduce your pet to the boat in incremental steps. Ideally, begin the exposure when the animal is young. When Frank and Nancy McCabe of Solomons, Md., decided to take their two cats on a seven-month cruise on the Intercoastal Waterway, they invested time to make the felines feel at ease. “First we took them to the boat and just sat below with them. The next time, we turned the engine on but stayed at the dock,” said Nancy McCabe. They gradually worked up to a day sail, then a weekend, then a week-long cruise. Be alert even at the dock, because surprisingly, that’s where many accidents happen. Terri Parrow, vice president of Internet Operations for BoatUS, a boat owners association, was washing the deck of her 33-foot sport-fishing boat docked in Friendship, Md., when one of her Jack Russell terriers slid down the soapy catwalk, jumped on the gunwale and tried for the dock. He missed and landed in the water. Practice swimming and rescue drills with your pet. Parrow had already trained her pups to paddle to a swimming platform so they could be helped back on board. “You have to figure things out in advance,” she said. “What would you do if. . .” Fill in the blank, then make a plan. Pet and owner should practice drills on a nice day, when it’s “play,” so everyone knows the procedure. Pet-overboard drills should also include what to do when underway. As Ed Johnson, who lives aboard his boat at Washington’s Gangplank Marina, points out, “A sailboat pulling a dog overboard on a lead attached to a PFD is not quite the same as dragging a pooch two feet behind the props on a cigarette boat doing 40 knots.” Frank Fitzpatrick of Rockville has trained his Labrador, Max, to grasp a mouth-size float on a rope so that the dog can be pulled to shore if he falls overboard. Terri Parrow’s Jack Russells model their PFD’s with handles-for easy lifting. If you must tether your pet, do so in a secure area on a short lead. A body harness with a lifting strap is helpful when your pet is tethered. 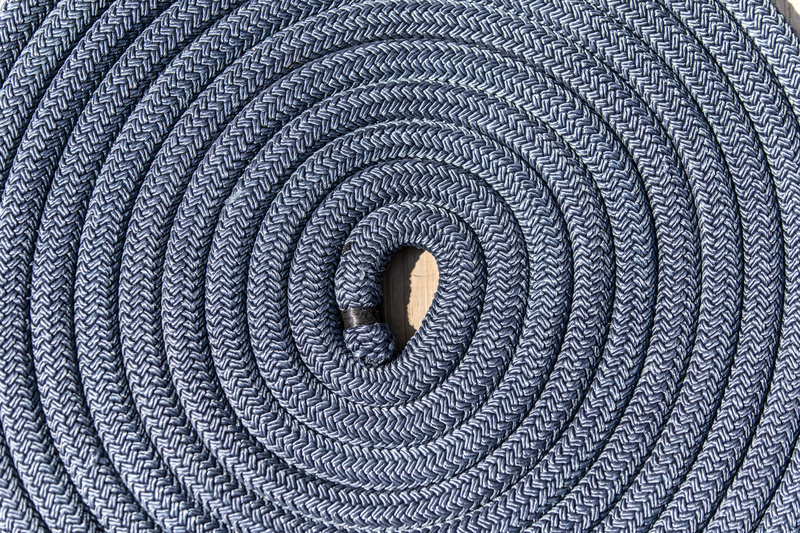 Never tether a pet at the neck, and never leave a tethered pet unattended on deck or dock. Provide traction on deck. There’s an ongoing debate over whether wooden decks are better than fiberglass. “Fiberglass is slippery by nature, and even worse after we spend hours waxing it,” said Blaine Parks, who cruises full time with his wife and two golden retrievers. The Parkses use ordinary bathroom throw rugs with non-slip backings to help with the dogs’ footing. They’ve even snapped indoor/outdoor carpeting to the floor of their dinghy to give their dogs better traction on bouncy trips to shore. Make sure your pet has a chance to exercise. Cats tend to get all the exercise they need by crawling up, over and through spaces on a boat, but dogs, especially larger ones, need to get rid of pent-up energy. While occasional trips to shore in the dinghy are preferable, they’re not always feasible. Parks and his wife use stretching exercises and physical therapy on their golden retrievers to keep the blood flowing. Landry spends 30 minutes throwing a Frisbee to his dogs before setting out on the water. Swimming is good exercise for dogs, but water conditions and the dog’s stamina must be carefully monitored. “Dogs won’t tell you when they’re tired, so you have to listen to their breathing and watch their strokes,” said Landry. He recommends hydrating dogs before letting them in the water — otherwise they’ll drink from the river, lake or bay, and “you end up with a sick dog.” Landry has trained his dogs to drink from sports bottles, which are easy to carry on his kayak. Cats have two options: an anchored litter box or using the “head” (the toilet on a boat). Don’t laugh. Training a cat to straddle a toilet seat requires tremendous patience, but it can be done. For dogs, a box of sod or a piece of AstroTurf may work as a substitute when landfall is not possible. Some people simply train their dogs to go on the bow, giving a whole new meaning to the term “poop deck,” but this practice is hazardous in rough water. Whatever method you choose, be sure your pet understands what is expected before setting out. Before pulling up to dock or shore, check ahead — some marinas (such as the Washington Sailing Marina) do not allow pets, and many parks and wildlife areas do not permit pets ashore. Always carry your pet’s rabies vaccination certificate and health records when on land.